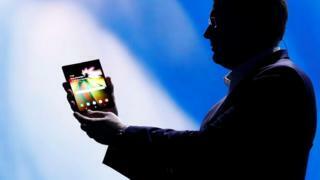 When unfolded the device resembles a 7.3in (18.5cm) tablet. When closed a separate smaller display on the handset’s other side comes into use. However, both were upstaged a week ago when a little-known start-up, Royole, unveiled a foldable phone of its own. Neither did it disclose how it will brand the phone. It did, however, reveal that the forthcoming handset would be able to run three apps at once.